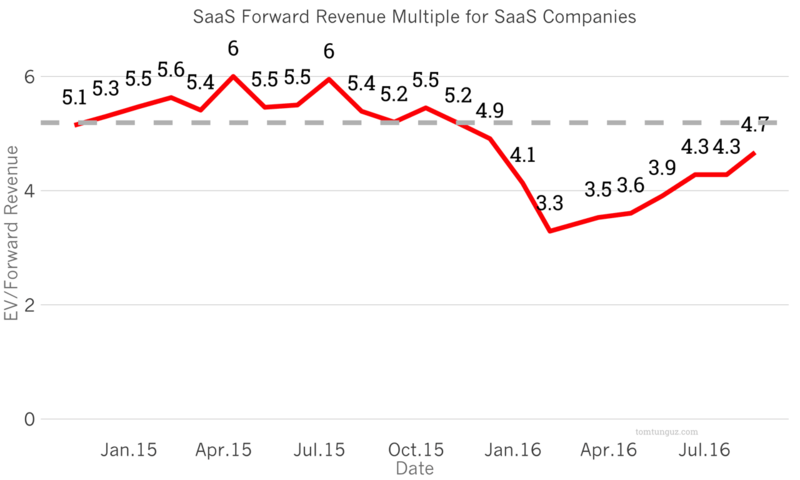 In February, public SaaS companies had fallen 57% from their highs. The enterprise value to forward revenue more than halved from 7.7x to 3.3x. This ostensibly random valuation correction has triggered a flurry of consolidation in software, with nearly $70B+ worth of exits year to date in 2016. Over the last six months, however, forward multiples have reverted to the mean. After touching a low of 3.3x forward in February, forward multiples have appreciated by 6% for each of the last six months. 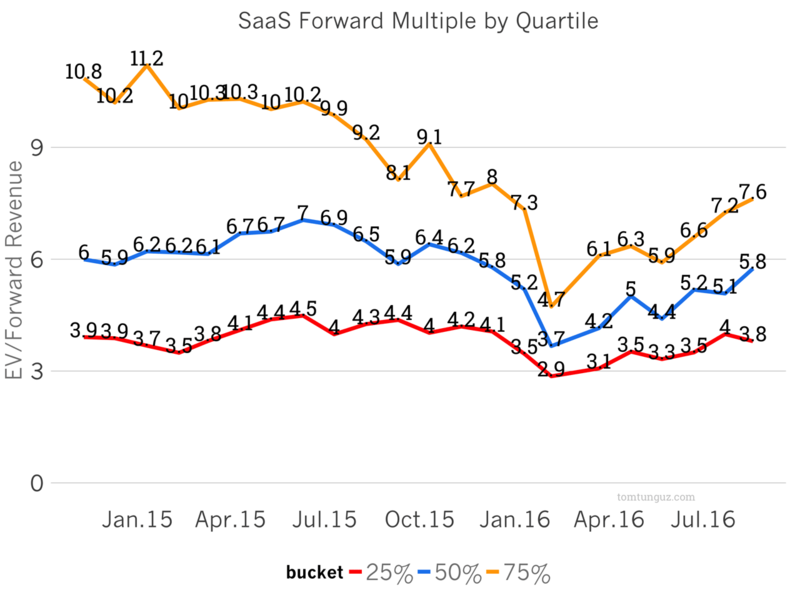 Overall, SaaS companies now trade at 4.7x forward, which is quite nearly the median for the last two years of 5.2x. In other words, we’re back to a “normal” valuation environment. I say “normal” because there is no right way to value SaaS companies; it’s just what the market will bear. The top quartile companies have rebounded the fastest, nearly doubling their forward multiples. That’s not surprising given these companies are growing fastest, have the most attractive margin profiles and none suffered material changes in their business’ over the past six months. All of these vacillations of the public market seem to have impacted valuations in Series D and later rounds, but haven’t pressured early stage valuations downwards. The early stage market, bolstered by near record amounts of venture capital fundraising, remain insulated. Depressed multiples have triggered consolidation and though we’ve seen some appreciation in public SaaS forward multiples over the past six months, I suspect the wave of consolidation continues because prices remain rational, and even below historical norms.